If your kid is ready to start reading, our phonics worksheets are a great place to start. We have all kinds of printables that are a great foray into the wonderful world of words. 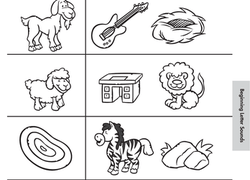 From beginning sounds to blends and digraphs, our worksheets and coloring pages will equip your little learner with all the skills he needs to read. Keep your eyes peeled for our phonics busy books that help kids take pride in their phonics progression. Check out our reception phonics printables and help your kid get a jump on mastering essential literacy skills. Practise sounding out and identifying blends at the beginning of words with your first grader with help from this worksheet. Help your preschooler learn the alphabet and practise letter G sounds all while having fun and coloring! Help your preschooler learn the alphabet and practise letter M sounds all while having fun and coloring! Help your preschooler learn the alphabet and practise letter U sounds all while having fun and coloring! Help your preschooler learn the alphabet and practise letter W sounds all while having fun and coloring! Not many common things start with X. Can your child spot the things that start with X on this page? All aboard! Let's chug through the alphabet, learning beginning sounds of words. It's a great way to give your preschooler some early language skills. Help your preschooler learn the alphabet and practise letter Z sounds all while having fun and coloring! Help your preschooler learn the alphabet and practise letter Y sounds all while having fun and coloring! 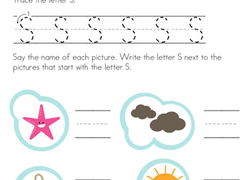 Build your kid's knowledge of beginning letter sounds with this alphabet worksheet. Say the letters and match it to the pictures with those beginning sounds. Get your preschooler ready for reading by practising matching up pictures with the same beginning sound. Help your child practise saying the letters of the alphabet with this phonics worksheet, which introduces beginning sounds. Things that Start with R! Help your child practise alphabet phonics with this picture game about things that start with R. Learning letter sounds in words is great for reading later on.